Welcome to Programming with C#. 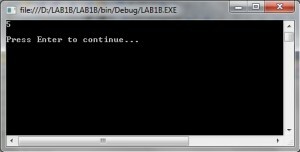 The purpose of this three-part lab is to walk you through the following tutorial to become familiar with the actions of compiling and executing a C# program. 4. Given a simple problem using input and output, be able to code and test a program that meets the specifications. 5. 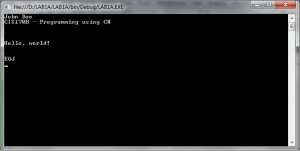 Be able to debug a simple program of any syntax and logic errors. 4.	the degree to which an exercise’s specifications are met. Preparation: If you are using the Citrix remote lab, follow the login instructions located in the iLab tab in Course Home. Locate the Visual Studio 2010 icon and double click to open. Under Applications, click on the Microsoft Visual Studio.NET 2010 icon to open the C# software. Choose File->New Project, and click Console Application. In the project name box, enter LAB1A. Your screen should look like the screen below. If so, press the OK button. Your screen should now look like what you see below. Now, highlight all of the code that you see [Ctrl + A] and press the Delete key. You will not need this code because you will now be getting experience writing every line of a new program. Now enter the following C# program exactly as you see it. Use the tab where appropriate. (Note: C# is case sensitive.) Instead of John Doe, type your name. Save your program by clicking File on the menu bar and then clicking Save Program.cs, or by clicking the Savebutton on the toolbar or Ctrl + S.
To compile the program, click Debug on the menu bar and then click the Build Solution or Build LabAoption. You should receive no error messages in the Error List window below the program. If you see some error messages, check the code above to make sure you didn’t key in something wrong. You can double click on each error message to better navigate to the area where the problem might be. Once you make your corrections to the code, go ahead and build the solution again. •	press the F5 key. Copy your source code and paste it into your Word document. Make sure you close your previous program by clicking File >> Close Solution. Now, create a new project and name it LAB1B. 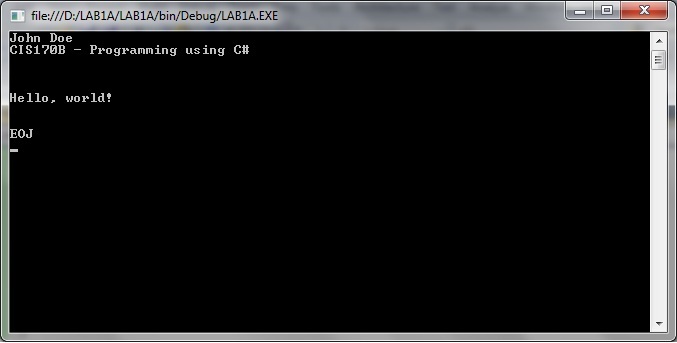 Like before, delete the code that is automatically created and enter the following program. Type in your name for Developer and current date for Date Written. 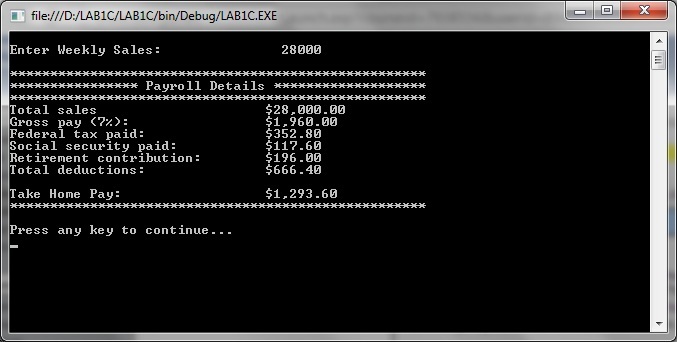 To compile the program, click Build on the menu bar and then click the Build Solution or Build LabB option. You should receive no error messages. If you see some error messages, check the code above to make sure you didn’t key in something wrong. Once you make your corrections to the code, go ahead and click Build >> Build Solution again. Once you have no syntax errors, to execute or run your program, click Debug on the menu bar and then clickStart Debugging. Go back to the editor and insert meaningful comments that show that you understand what each line of code does. 1. Run the program again. 1. Make sure you close your previous program by clicking File >> Close Solution. 2. Create a new project and name it LAB1C. 3. This time, do not delete the code that gets automatically created. Instead, insert your code right between the curly braces, as illustrated below. o	// your code goes here! Include a comment box like what you coded in Part B at the very top of your program. Input: Prompt the user for the weekly sales. Process: Perform the calculations. The employee receives 7% of his or her total sales as his or her gross pay. His or her federal tax rate is 18%. He or she contributes 10% to his or her retirement program and 6% to Social Security. 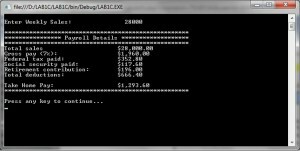 To compile the program, click Debug on the menu bar and then click the Build Solution or Build LabCoption. You should receive no error messages. If you see some error messages, check the code above to make sure you didn’t key in something wrong. Double-click on an error to navigate to its location in the code. Once you make your corrections to the code, go ahead and click Debug >> Build Solution again. Once you have no syntax errors, to execute or run your program, click Debug on the menu bar and then clickStart Debugging, or press the right arrow icon or the F5 key. 2. Copy your commented code and paste it into the Word document. After you have completed your lab, complete the following for each part of the lab (if there are multiple parts). 3. Save the Word document as CIS170B_Lab01_B_LastName_FirstInitial.docx. 4. Upload all three projects folder and save the compressed file as CIS170B_Lab01_B_LastName_FirstInitial.Zip. 5. Submit both the compressed project file and the Word document to the weekly Dropbox for this lab. When you submit your project files, you will want to send the entire project folder that is created by MS Visual Studio when you create the project, along with your MS Word file. Use your favorite compression tool to zip the full contents of both projects, zip the single zip file, and submit the zip file to your Dropbox.